(Francisco Kjolseth | The Salt Lake Tribune) U.S. President Donald Trump is surrounded by Utah representatives at the Utah Capitol on Monday, Dec. 4, 2017, as he signs the presidential proclamation to shrink Bears Ears national monument. • Filed: Federal district court in D.C.
• Plaintiffs: Five American Indian tribes (Hopi, Navajo, Ute Indian, Ute Mountain Ute, Zuni). • Defendants: President Donald Trump, Interior Secretary Ryan Zinke, acting Bureau of Land Management Director Brian Steed, Secretary of Agriculture Sonny Perdue, U.S. Forest Service Chief Tony Tooke. • Argument: Under the Antiquities Act of 1906, the president does not have the legal authority to revoke or modify a monument — only to designate one. Additionally, the tribes say the 1.35 million acres set aside by President Barack Obama holds spiritual significance and contains cultural artifacts that deserve protection at the threat of looting, grave-robbing, vandalism and development. • Plaintiffs: A broad coalition representing American Indian tribes, recreation interests and paleontologists (Utah Dine Bikeyah, Patagonia Works, Friends of Cedar Mesa, Archaeology Southwest, Conservation Lands Foundation, Access Fund, Society for Vertebrate Paleontology, National Trust for Historic Preservation). • Defendants: Trump, Zinke, Steed, Perdue, Tooke. • Argument: Reducing the 1.35 million-acre monument would threaten hundreds of historical rock art panels, artifacts, pueblos and kivas. For its part, Patagonia insists the cuts would hurt the company financially by taking away recreation areas that provide “some of the best rock climbing in North America” used by its customers. Development in the area, adds Friends of Cedar Mesa, would mean “direct and immediate harm” to the paleontological hot spots within the monument’s boundaries, and oil and gas drilling would “result in the destruction and degradation” of the ecosystem. • Seeking: An order requiring Trump to restore the original monument and bar his administration from acting on the reconfigured designations. • Plaintiffs: 11 conservation groups (The Wilderness Society, National Parks Conservation Association, Sierra Club, Grand Canyon Trust, Defenders of Wildlife, Great Old Broads for Wilderness, Western Watersheds Project, WildEarth Guardians, Center for Biological Diversity, Natural Resources Defense Council, Southern Utah Wilderness Alliance). • Argument: Trimming the monument would threaten “irreplaceable” archaeological artifacts and damage paleontology sites. • Seeking: Injunctive relief to block mining and oil and gas drilling on the land. • Plaintiffs: 10 environmental groups (The Wilderness Society, Defenders of Wildlife, Natural Resources Defense Council, Southern Utah Wilderness Alliance, Grand Canyon Trust, Great Old Broads for Wilderness, Western Watersheds Project, WildEarth Guardians, Sierra Club, Center for Biological Diversity). • Defendants: Trump, Zinke, Steed. • Argument: The lawsuit alleges Trump is stripping protection for land that would leave “remarkable fossil, cultural, scenic and geological treasures exposed to immediate and ongoing harm.” That includes the Kaiparowits Plateau, which holds abundant coal deposits and is a paleontological treasure trove. • Seeking: Injunctive relief to stop Trump’s proclamations from taking effect so that no permits are issued for oil and gas leasing or coal and mineral mining. • Plaintiffs: Grand Staircase Escalante Partners, Society of Vertebrate Paleontology, Conservation Lands Foundation. 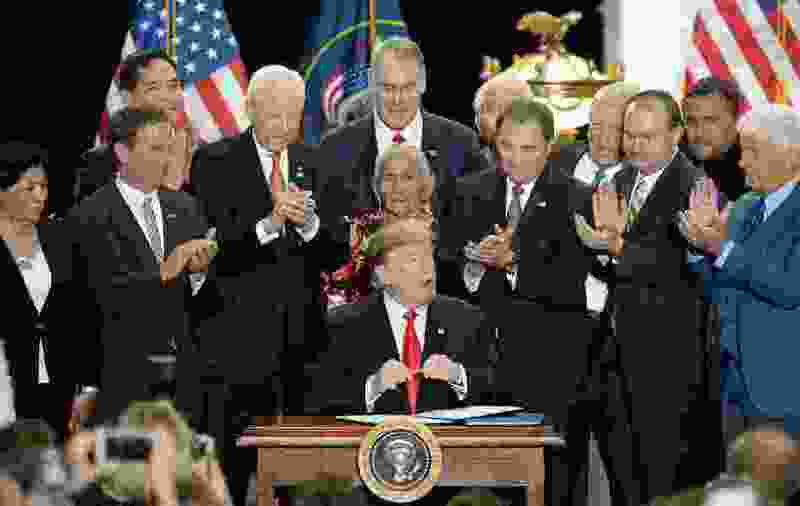 • Argument: Removing protection from nearly 900,000 acres in the monument would threaten “sensitive resources located there,” including plant and bee species, archaeological artifacts and geological formations. The president’s actions were illegal. • Seeking: An injunction to stop Trump and Zinke from “recognizing, enforcing or otherwise carrying out” the downsized designations.